Step 1 Heat oven to 180C/160C fan/gas 4. Line a 12-hole muffin tin with 12 large muffin cases. In a jug, mix the eggs, yogurt, oil, apple sauce, banana, honey and vanilla. Tip the remaining ingredients, except the seeds, into a large bowl, add a pinch of salt and mix to combine. Step 2 Pour the wet ingredients into the dry and mix briefly until you have a smooth batter – don’t overmix as this will make the muffins heavy. Divide the batter between the cases. 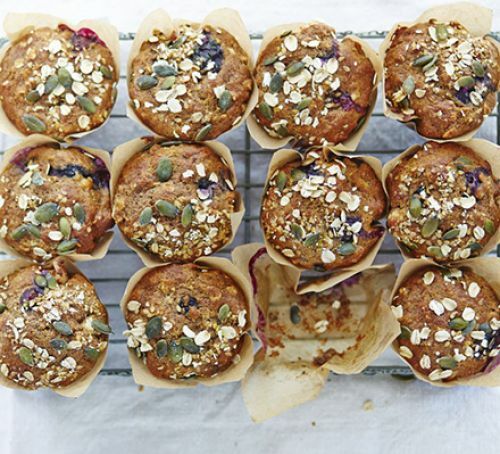 Sprinkle the muffins with the extra oats and the seeds. Bake for 25-30 mins until golden and well risen, and a skewer inserted into the centre of a muffin comes out clean. Remove from the oven, transfer to a wire rack and leave to cool. Can be stored in a sealed container for up to 3 days.